Boost: A transmission line near Gurgaon. PGCIL aims to increase India’s inter-regional transfer capacity to 37,000 MW by 2012. Ramesh Pathania / Mint. 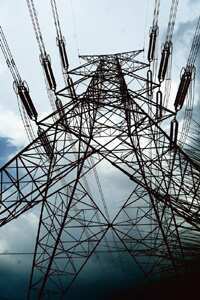 New Delhi: State-run transmission utility Power Grid Corp. of India Ltd, or PGCIL, plans to seek an additional loan of $1.5 billion (Rs7,200 crore) from the World Bank to meet its estimated capital expenditure requirements of Rs85,000 crore in the 12th Plan period (2012-2017). This is over and above the $3.1 billion in loans already approved by the multilateral funding agency for PGCIL, including $1 billion cleared last week for the utility as part of the World Bank’s largest loan package for India. The interest rate on this loan will be linked to the London interbank offered rate, or Libor. Libor is the rate that the most creditworthy international banks dealing in euro-dollars charge each other for large loans. India is trying to reinforce its deficient power infrastructure to boost output. Shortages arising from limited generation capacity, transmission losses and growing power theft have been identified as key infrastructure bottlenecks in a country that has an installed capacity to generate 147,000 MW. “It is imperative for organizations such as the World Bank to partner with public sector units in India, particularly when it comes to making investments in critical infrastructure-linked sectors such as power," said Monish Chatrath, executive director at consultancy Mazars India. “At a time when there is still uncertainty in the context of the nature, timing and extent of the economic turnaround in India, the general corporate mood in the power sector is towards introspection, integration and consolidation. In this scenario, the public sector has a real opportunity to show enterprise," Chatrath added. The World Bank cleared a loan package of $4.3 billion for India on 22 September to support the government’s plans to reinforce the capital of state-owned banks, build infrastructure and boost economic growth. Of this, $1 billion is for PGCIL to help the company strengthen the country’s grid system to allow it to handle a greater load. “The World Bank certainly looks forward to continuing its productive relationship with PowerGrid, including through providing lending and non-lending support," a World Bank India spokesperson said in an email response to queries from Mint. “However, with regard to new lending, this would need to be looked at in the context of Government of India priorities for the use of relatively scarce IBRD (International Bank for Reconstruction and Development) funds available to India," the spokesman added. The World Bank is the name used for IBRD and the International Development Association. The World Bank has been associated with the Indian power industry for long. Over the last decade, it has provided support to Union government entities for generation, transmission and renewable energy investments, and to selected state electricity boards for investments associated with sectoral reform. PGCIL operates around 71,500 circuit km of transmission lines and 120 substations. While India has an inter-regional power transfer capacity of 20,800 MW, PGCIL plans to increase it to 37,000 MW by 2012. The public sector unit has a capital expenditure plan of Rs55,000 crore for the 11th Plan (2007-12). Of this, Rs16,500 crore has already been spent. While 35% of this outlay is for strengthening the transmission system, the balance will be used for setting up links to power generation projects. For PGCIL, 30% of capital expenditure in any Plan period comes from internal accruals, with the balance being funded by loans. Of the loan amount, around 40% is borrowed from the domestic market, with the balance coming from international lenders such as the World Bank and the Asian Development Bank. “Of $3.1 billion in loans already approved by the World Bank, loan agreements have already been signed for $2.1 billion, with the tripartite agreement between the bank, PGCIL and government of India for the recently approved loan amount of $1 billion to be signed shortly," said a PGCIL executive who did not want to be identified. PGCIL posted a net profit of Rs1,691 crore on revenue of Rs7,029 crore in 2008-09.